March 25, 2017 0 comments on "Rice Krispie Treat Bird Nests"
I’ve made a lot of fun Easter treats in the past, like these easy Rice Krispie eggs, but this year I decided to try something new. 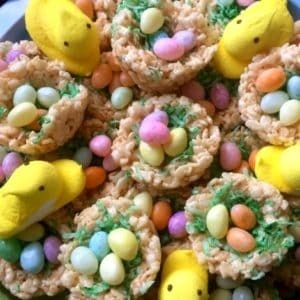 These Rice Krispie treat bird nests are really fun and easy to make. They are a perfect treat for Easter or any spring party. Heat butter or margarine over low heat in a non stick sauce pan until melted. Stir in marshmallows and heat until melted. Remove pan from heat and stir in Rice Krispies until completely coated. You can either shape the nests by hand or press the Rice Krispies into a nest shape by spooning them into muffin tins. You will need to work fast, as the Rice Krispie mixture will cool quickly. Butter your hands so that the mixture will not stick to your hands. After you have shaped the bird nests, you can add green “grass” to them by coloring some coconut with food coloring. You will only need about a 1/2 c. of flaked coconut. Place the coconut in a small bowl and add a couple of drops of green food coloring. Stir the food coloring into the coconut until the coloring is evenly distributed. Place the colored “grass” into your nests. Add some jelly beans to your nests for the eggs, and you’re done! Note: If you are not going to serve these right away, cover them with plastic wrap or store in an airtight container so that they don’t dry out. They will stay fresh for 2-3 days. Yield: Approximately 24 bird nests. Follow my Easter board on Pinterest.